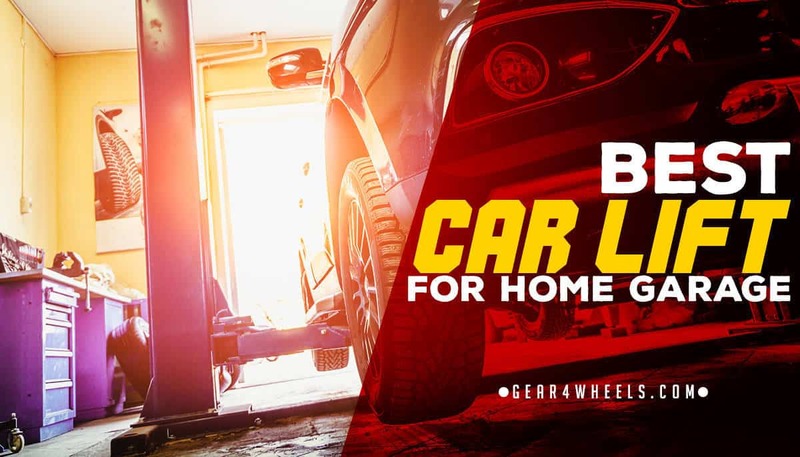 Home garage lifts can be useful for either dealing with basic home maintenance on a car, or for storing 2 vehicles within a garage that only has the length and width size for a single car. They can come in single-vehicle units that hoist one car from the ground, or double-car units that stack one on top of another. To help you decide, we’ve put together a list of 5 of the best home garage lifts that you can pick up on the market right now. 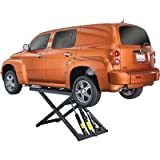 ​Below is a list of the best car lifts for home garages, which include a range of different types of lifts suitable for a residential garage. 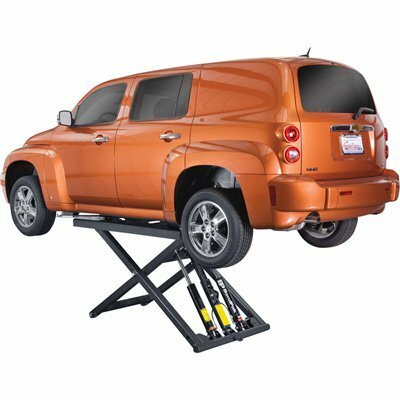 Released onto the market around mid 2014, the Mid-Rise Scissor Lift from BendPak is a portable home garage lift that can fit a single vehicle on at a time. It’s perfect for the home user dealing with maintenance on just one car or truck up to 6,000 lb. It's also powered by just a 110-220-volt electric motor, making it compatible with simple mains AC power supplies. The BendPak home garage lift is powered by a 1-phase 110 to 220-volt electric motor that can reach its full height in 45 seconds. As well as providing smooth lifting power, the motor can lower to around 4 ¼ inches, allowing it to fit under a wide range of vehicles. A portable motor cart acts as a tow handle, which allows the lift to moved quite easily from one bay to another. The lack of posts that might be included on 2- or 4-post designs mean that this model is more space-conscious than larger home garage lifts. The design also makes it easy to fold up and transport when required. In terms of build quality, the BendPak lift is easily one of the frontrunners with thicker and more robust steel frames than many more cheaply built competitors. Though easy to fold for transportation, the total weight of this product is not so forgiving, at around 900 lbs. The simple frame design also allows less room underneath for working on the hoisted vehicle, as well as less supportive frames overall. 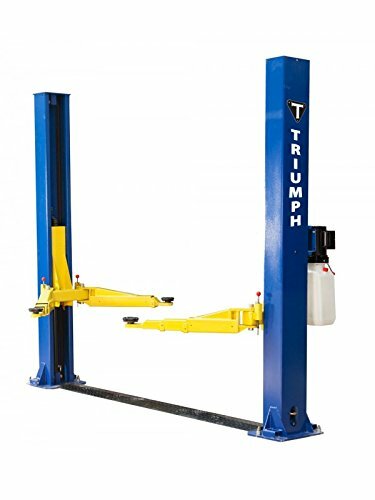 The TRIUMPH NSS-8 storage service lift is a mid-range product capable of holding a single vehicle for storage or light maintenance, inside of a home garage, with a second vehicle below. Available since the end of 2014, this lift uses a 4-post design to improve stability and thus potential lifting height. The design of this lift allows for the storage of 2 cars within a single-car garage, provided the ceiling height permits it. A drip tray prevents chemical spillage from the top vehicle onto the one stored beneath, whilst a caster kit aids easy movability. Automatic locking allows the upper vehicle to be locked at 10 different levels. It's one of the few we've listed here with 4 posts, which offer superior stability and support using less space. This home garage lift comes with a caster kit, which can be fitted to the lift for easy maneuverability around the garage. The lift is also competitively priced, costing the same as some competitor models with lesser capacities. The 4-post design is partly responsible for both this and the generous lifting height. Of course, as mentioned above, the free included accessories help to improve the appeal of this product. Some users have complained that the steel cable, running beneath the wheel ramps, can rub against the hydraulic lines, which could lead to gradual wear. Many of the components also weigh several hundred pounds, which can make them hard to move around. Finally, clear installation documentation could go a long way towards speeding up the time it takes to set this up. This product has been around since June 2014, though it's one of the lesser known models on the market. Capable of storing 2 vehicles simultaneously, the upper lift can support up to 8,000 lbs. and has built-in safety features. It's not the best-known brand on the market when it comes to home garage lifts, but it offers one of the greatest lifting heights of the products we've looked at here. The redundant ladder lock safety feature is something not always included in these home garage lifts, while XL slider blocks increase vehicle stability. The lift also includes steel approach ramps to increase the ease with which vehicles can be loaded into the lift runway.The 18-inch wide runways are crafted from a single piece of non-skid diamond plate to improve tire traction when loaded onto the lift. This product is built from aircraft-grade materials, specifically the cables that are rated at 14,500 lbs. It also has built-in safety features; in the unlikely event of a failure in the cables, an auto engage locking bar ensures that the lift will lock at one of 10 height positions. 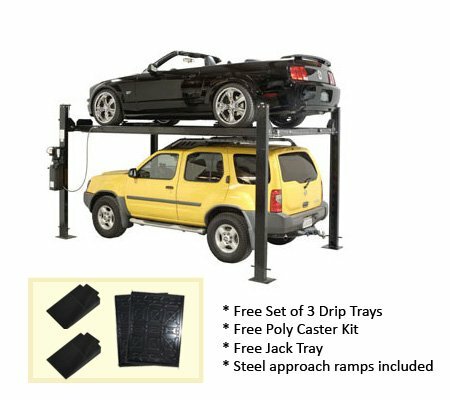 Finally, free accessories that come with the product include a jack tray, drip trays and a set of castors for moving the lift around the garage. Much like the TRIUMPH lift model above, this one comes with unclear documentation that can make assembly more long-winded. It can also take several people to put together, owing to the sheer weight of some of the components. 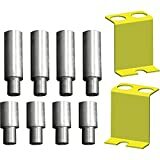 Finally, though a minor complaint, the castors would be easier to move if they were made from or encased within rubber. At the budget-end of the market, as far as home garage lifts go, the TRIUMPH NT-9 provides 9,000 lbs. of lifting capacity on a 2-post support system. The lift has been available since December 2014 and is a good option for those looking to spend less without sacrificing on quality. Swing arm handles increase the speed and ease with which you can position the garage lift arms, whilst three-stage front arms extend wide reach to a variety of cars and trucks. A floor plate also covers all cables and hosing. The product includes a power unit, or motor, and boasts just shy of 10,000 lbs. of lifting power. The design of this home garage lift lends itself to the garage with smaller dimensions, as it incorporates 2 steel support posts, as opposed to 4 used in many other designs. That aside, the customer support for the brand is exceptional. Though lacking in product guidance, the company provide a wealth of information quickly and accessibly, and a 1-year warranty on the lift. Finding good specifications for this product online can be tricky, particularly when it comes to the exact dimensions of the wheel runways. This is compounded by the fact that the product manual is not always included with the lift. Installation can take quite a while as a result, though also in part due to the complexity and weight of the components. BendPak offer excellent-quality home garage lifts, with some of the most durable components on the market. This lift also offers the greatest lifting capacity featured on this list. It has a great reputation as a product and has been available the longest out of all these reviewed products, coming into the market since September 2013. This lift features an expandable top beam with Tru-Metric supportive arms. It has double-telescoping screw pads and stacking adapters as standard accessories. What's more, there's direct drive low-pressure cylinders that reduce and minimize leakage. This asymmetric lift comes with 30° rotated columns that lend themselves to additional door-opening clearance and better access to car interiors whilst loaded into the lift. The BendPak brand is also well known for durability and stability, using high-quality steel in the construction of life components. 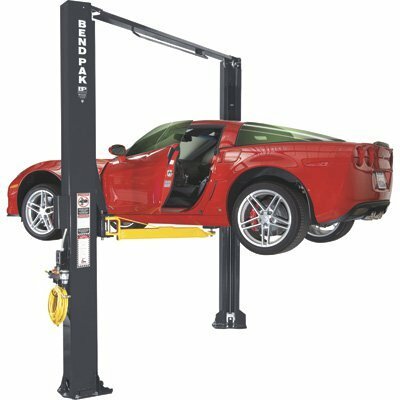 As far as price tags go on home garage lifts, this one comes in at the higher end of the budget range. This price tag also doesn’t include any free accessories seen with some comparable products, such as drip trays. Finally, the ceiling clearance required for a lift capable of raising to 69 inches is quite considerable, though the potential height of this lift is more of a benefit than a drawback. 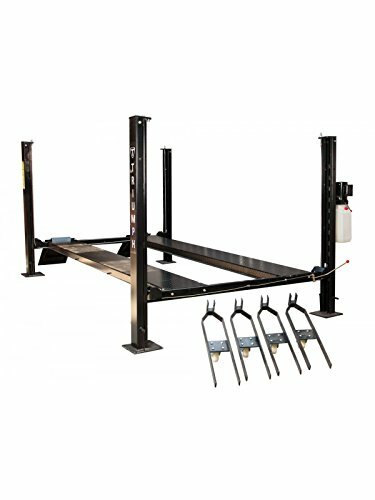 Our pick for the bunch of these home garage lifts is the BendPak Portable Mid-Rise Scissor Lift – 6,000lb. Capacity. For a single vehicle, and as a non-posted design, it is still capable of lifting a considerable load. Though it may not have the greatest capabilities, the steel build is also tougher and more durable than many competing lifts. All things considered, the price tag is still very reasonable.